Plesiosaurs – the order Plesiosauria – are a group of secondarily aquatic carnivorous reptiles belonging to the clade Sauropterygia within the diapsid clade Euryapsida (Tayor, 1989; Caldwell, 1997). The Plesiosauria has retained phylogenetic validity for well over 150 years, since the formal identification of the clade by de Blainville (1835). Unfortunately, this long history has hindered modern systematics of the group. The order Plesiosauria (plesiosaurs) consists of two superfamilies. 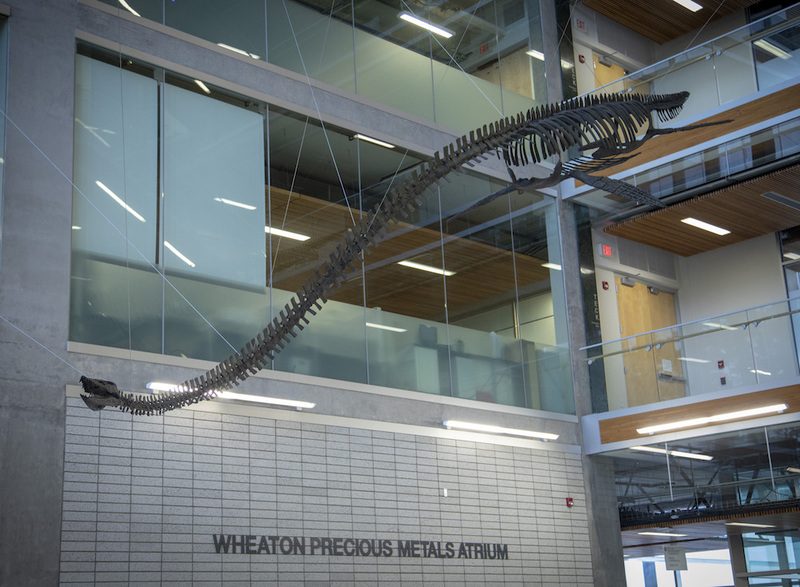 The Pliosauroidea (often termed pliosaurs) are typically short-necked, whereas the Plesiosauroidea (often termed plesiosaurs, but it gets complicated) are typically long-necked. However, generalisations based on neck length are today considered unreliable as research into plesiosaur evolution and phylogeny continues. 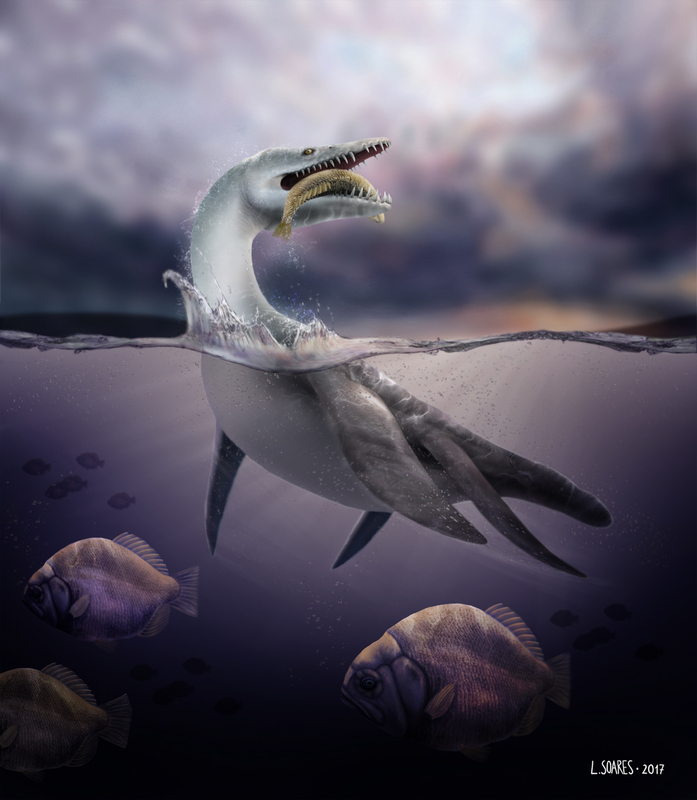 The family Polycotylidae, for example, is a Late Cretaceous group of short-necked plesiosaurs that are traditionally regarded as pliosaurs. However, cranial evidence (Carpenter, 1997) points to a plesiosauroid affinity for them. Similarly, the pliosauroid genera Eurycleidus and Attenborosaurus are pliosaurs with relatively long-necks. 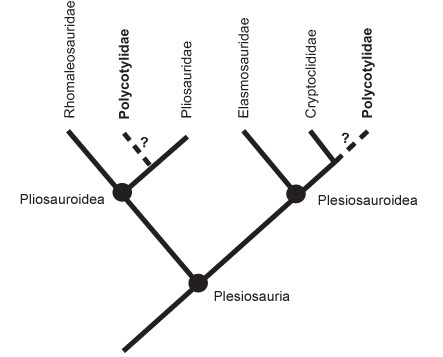 Simplified cladogram of Plesiosauria showing the alternative positions proposed for Polycotylidae. Contrary to popular accounts (e.g. Lambert et al. 2001; Smith, 2003a), plesiosaurs were not an exclusively marine group and remains are known from freshwater and lag oonal deposits (e.g Wiffen and Moisley, 1986; Cruickshank, 1997; Sato, 2002). 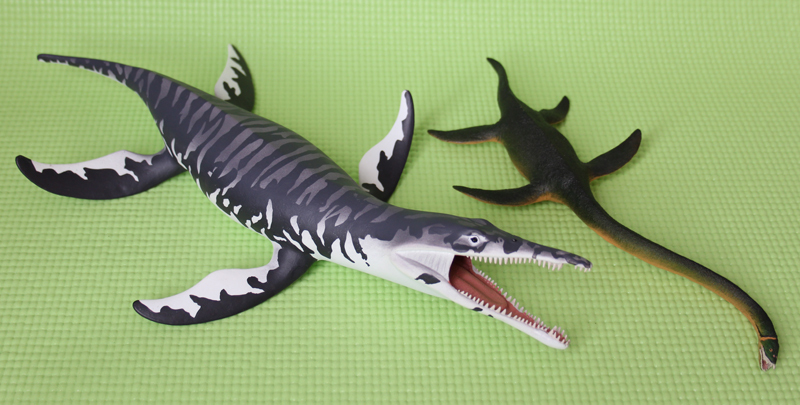 Ambiguous plesiosaur material occurs in Middle Triassic deposits (Benton, 1993) but the first diagnostic plesiosaurs are uppermost Triassic in age (Taylor and Cruickshank, 1993b; Storrs, 1994, 1997). The lineage reached a cosmopolitan distribution by the Early Jurassic, a maximum diversity in the Late Jurassic (Sullivan, 1987) and persisted successfully to the Uppermost Cretaceous. Plesiosaur vertebrae of putative Palaeocene age were wrongly dated (Lucas and Reynolds, 1993). the limbs into paddles, of which both fore and aft are similar. Within the lineage, pliosauromorph forms with large heads and short necks were more rapid and maneuverable swimmers than plesiosauromorphs with long necks and small heads Robinson, 1975; Massare, 1988; O’Keefe, 2001b). Despite these general morphotypes, the gross morphology of the postcrania remained conservative throughout the evolution of the group (Carroll, 1988; Storrs, 1999). Famously described by many, including Owen (1860 p. 230), “as a snake threaded through the trunk of a turtle”, the typical plesiosauroid bauplan (body plan) was spectacular enough to defy belief by scientists of the day (Taylor, 1997; Cadbury, 2000), when Mary Anning discovered the first complete Plesiosaurus in 1823. The name Plesiosaurus was coined two years prior for remains “presenting many peculiarities of general structure” (De la Beche and Conybeare, 1821, p. 560).